Five days after arriving in Shanghai I am just about getting the hang of it all. It would take more time than I have at the moment to communicate what has happened these past days…and perhaps it is not possible to adequately convey to you. There will be photos so you will get a sense of what things look like. From what I have seen and picked up from talking to monks and others along the way Buddhism is alive and well and growing. We were very fortunate to stay one night at Tiantong Temple near Ningbo, Zhejiang where Zen Master Dogen came to practice in the 12th Century. We joined in the daily practice with the 100 plus male monks, met the Abbot and even joined a formal breakfast. 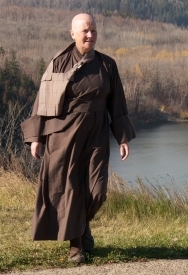 Doing that was a first for a female western monk, and probably a first for a male western lay person too. You should have heard the silent gasp as we walked in! We were very fortunate to be traveling along with a novice monk from the Tiantong Temple for three days while we have been here. He escorted us to Puto Shan which is an island one hour ferry ride from the mainland and a major pilgrimage site for devout Buddhists. Ru Xian Shi, the monk, was both an inspiration and a doorway into a China we would not otherwise have known. There is much to say about these days however I see the clock ticking away. Today we travel by bus, the train line having been closed, to our next destination. Thankfully Ru Xian has written our hotel name in Chinese script as well as instructions to taxi drivers to get us to the bus station here in Ningbo. 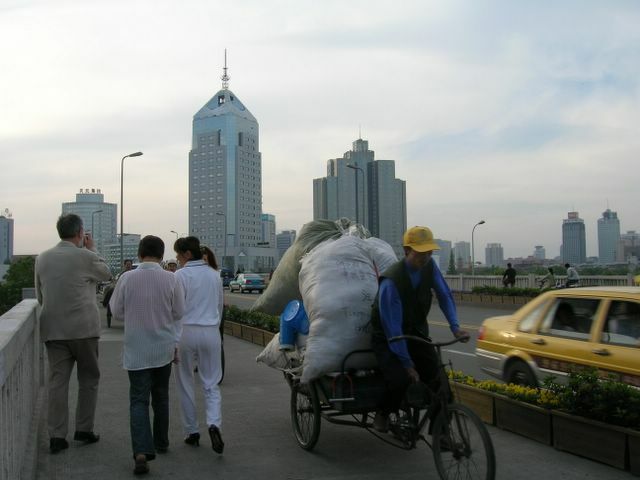 It cannot be over stated how difficult it can be to travel in China when you don’t speak or write the language. The pavement where ‘anything goes’ and most things do!